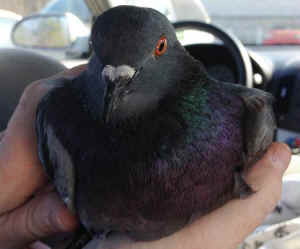 I am pleased to inform you that our relentless efforts against the notorious Philadelphia Gun Club (PGC) have dramatically reduced the number of shooters attending their live pigeon shoots. That means that in spite of corrupt officials refusing to enforce anti-cruelty laws, thousands of lives are being saved! At the start of this shooting season, there could be up to thirty vehicles packed with men and women who could not wait to spill as much blood as possible. At the shoot last Saturday, March 8, 2014, however, there may have been more workers at the shoot than participants. There were a total of twelve vehicles, and six of those were workers or service people. The tide has been changing throughout this season, as we have attended every shoot. Animal abusers don’t like our cameras and the exposure that follows. A month and a half ago when we secretly filmed one of the PGC members, Carl Badenhausen, driving on an Interstate Highway with covered license plates after leaving the PGC. We released that video on YouTube and two weeks later, at the following shoot, there were less than half the shooters as the previous one; eleven vehicles with at least four cars belonging to workers. 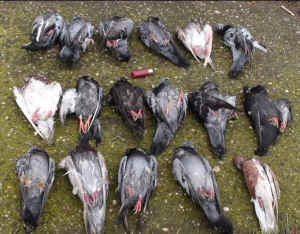 For more images, information and ways to help end live pigeon shots, visit Pigeon Shoots.